Marking a new chapter in the history of a treasured music venue that sparked a movement across America, the original Levitt Pavilion for the Performing Arts in Westport, Conn., will re-open this Sunday as a brand new, state-of-the art complex. The new pavilion was made possible in part by a lead capital gift of $4.5 million from the Mortimer & Mimi Levitt Foundation—the largest single gift in the foundation’s history. 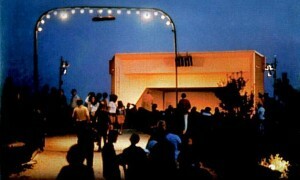 The Coney Island arch in front of the old Levitt Westport pavilion. The generous funds provided by the Levitt Foundation made it possible for the independent, Friends of Levitt Pavilion nonprofit to proceed with groundbreaking, in addition to receiving contributions from the town, state and private donors. To date, the Friends of Levitt Pavilion has invested close to $9 million in the transformation of their outdoor facility. The grand re-opening concert this Sunday will feature nine-time GRAMMY Award Winner Jose Feliciano to celebrate the new venue and kickoff Westport’s summer concert season. The ribbon cutting ceremony is slated for 6pm, where Mimi Levitt (who has served on the Levitt Westport board since its inception) and Liz Levitt Hirsch, as well as local and state dignitaries and Friends of Levitt Pavilion leadership, will be honored on stage. The concert begins at 7pm. Due to the extraordinary high demand for the opening concert, free tickets were issued in advance. Audience members must remember to bring their free ticket with them. This summer’s line-up is bursting with talented musicians such as jazz fusion band, Incendio (7/31), World folk band, Sultans of String (8/21) and GRAMMY-winning Vince Giordano and the Nighthawks (8/17). Levitt Westport will also present a special children’s series and a ‘Celebration Sunday’ series showcasing award-winning artists such as The Hot Sardines (7/27) and Heartbeat Dance Band (8/10). The new venue features state-of-the-art amenities and services for audiences and artists alike such as a lush RiverWalk and picnic grove, perfect for pre-concert picnics and activities. 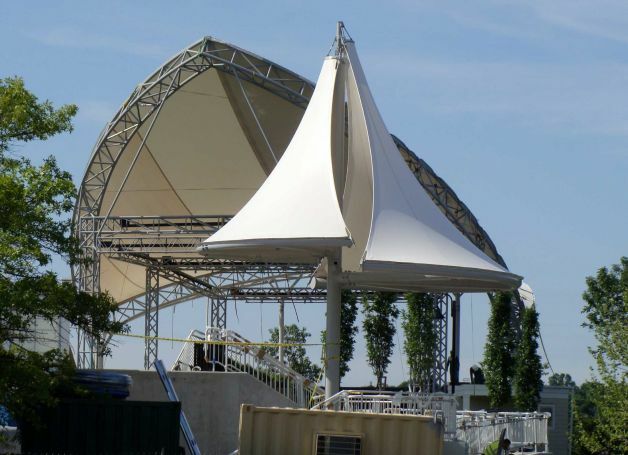 Graceful, sail-shaped canopies cover the performance stage, which also has vastly updated technical abilities, furthering Levitt Westport’s capacity to attract world-class artists. The complex also includes park areas and a community hospitality center where patrons can find food, drink, and indoor restrooms. Levitt Westport has been an anchor of the community and local economy for decades. Forty years ago, Mortimer and Mimi Levitt, summer residents of Westport, were approached to support a project to transform the town dump along the Saugatuck River into a community gathering space for the performing arts. 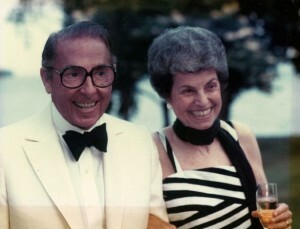 Mortimer and Mimi were major benefactors to the project, and much to their surprise, the venue was named after them in recognition of their generous gift. Today, the reimagined Levitt Pavilion will once again dazzle audiences and continue to fulfill Levitt’s mission to strengthen the social fabric of our communities through the power of free, live music. Inspired by the original Levitt Pavilion, the Levitt network has grown to include six venues (with an additional two in development) located in Los Angeles and Pasadena, Calif.; Memphis; Arlington, Texas and Bethlehem, Pa.; and future venues slated for Denver and Houston. Taken together, Levitt venues present the largest free concert series in America with over 300 concerts every year. Alexa Hanelin, Communications & Social Media Intern (Summer 2014), also contributed to this blog post. This entry was posted in News and tagged Heartbeat Dance Band, Incendio, Jose Feliciano, Levitt Foundation, Levitt Pavilion Westport, Liz Levitt Hirsch, Mimi Levitt, Mortimer Levitt, Sultans of String, The Hot Sardines, Vince Giordano & The Nighthawks on July 18, 2014 by Vanessa Silberman.